- Rotating transparent lid allows access to 6 separate compartments and easy viewing. 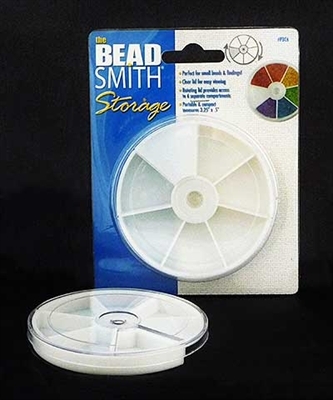 - Lid fits snugly so beads do not leak into adjoining compartments. - Portable and Compact. Measures 3 1/4" Diameter X 1/2" Tall. - Each Compartment holds up to 4.5 grams Size 11/0 Delica Beads. How to use: Hold the base with one hand & the clear lid in the other. Rotate the lid until the opening is positioned above the section you want to access. To close: Rotate the lid until the opening clicks into position above the raised portion of the base.